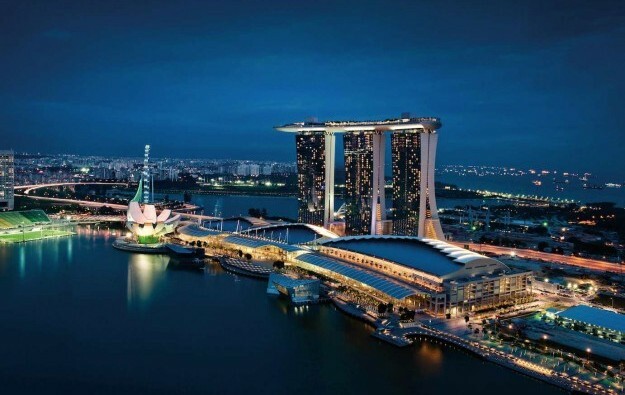 Marina Bay Sands Pte Ltd, developer and operator of Marina Bay Sands (pictured) casino resort in Singapore, is interested in running a casino and convention complex in Thailand, The Nation newspaper reported, citing Krist Boo, the company’s vice president for communications. The firm is a subsidiary of U.S.-based casino operator Las Vegas Sands Corp.
“We want to invest in Thailand if we are given permission. It must be the [same] kind of integrated resort as in Singapore,” Ms Boo was quoted saying. Ms Boo was speaking to a group of reporters from Thailand that is currently visiting Singapore, The Nation reported on Friday. In June a minority group on Thailand’s National Reform Council suggested legalising casino gaming in the country, the same newspaper reported in June. But the Thai Prime Minister, General Prayut Chan-o-cha, was subsequently quoted by other media saying his administration had more important things to think about. Las Vegas Sands has been linked in local media reports with an old railway depot site in Bangkok for a possible development were casinos to be legalised in Thailand. The country’s Ministry of Finance is reportedly revising the master plan for a vast plot of land used by the State Railway, which is expected to become an entertainment complex. “We have been searching for new investment not only in Thailand but also all places. Although Thailand has no casino act [law] yet, if this about to happen, it is very interesting,” Ms Boo reportedly said on Thursday. “For Thailand, we would love to have an integrated resort at a place close to the [Bangkok] city centre or financial centre, near the international airport,” she added according to the report.